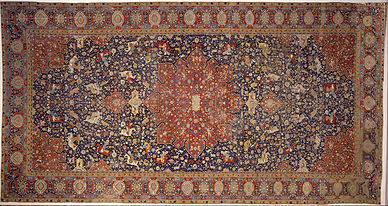 Wool and dyes are the raw materials needed for hand-knotted rugs. This is what one who wants to buy a rug for his house may think at first. But wool and dyes, are not enough. Some talented hands, a lot of time, imagination and creativity are required in order to have a hand-knotted rug completed. This explains why they are far more expensive compared to other house furniture. Think about one of these rugs in your living room. It is a cushy piece of art to watch and walk on. There are people who enjoy walking barefoot or laying on rugs and this is how they choose the carpet that are going to buy for their house. Carpets in general create a classy atmosphere in the house. Now imagine the change that a hand-knotted Oriental rug can make in your room. It can transform the image of your home. The good thing is that they can adapt to everything in the house including the latest interior decoration trends and contemporary art expressions. If you want something unique for your house, an Oriental carpet is what you will need. Oriental wool rugs are special and you cannot find two equal carpets weaved by the same man. The strange thing about those rugs is that even though they are created by people that live in the most remote villages of Iran, Afghanistan, or other countries in the Orient, they fit perfectly in modern environments. Weavers use high quality wool in order to guarantee the lifespan of a carpet. The wool quality is also related to the dyeing process. Better wool results in more beautiful colors and a higher price. A high quality hand-knotted carpet or rug is worth the money spent for it. If you are lucky and wealthy enough to find an ancient hand-knotted rug, it will be the same as finding a very rare painting or art work. If there is a variation in the colors of your carpet also known as abrash and patina this means that you are really lucky. Abrash is a naturally occurring dye change that can be found only in oriental hand-knotted carpets and rugs. On their part art collectors appreciate abrash as part of carpet’s oneness. Nomads explain abrash saying that that man is not perfect and so is what he creates, although they are the only who can make such beautiful carpets.